On Religious Freedom Day, January 16, 2019, local faith and civic leaders gathered at the North American Division (NAD) Headquarters in Columbia Md., for the NAD’s first Religious Freedom Prayer Breakfast. They celebrated the freedoms enjoyed in the United States and prayed for guidance in further fostering and sharing it with others. Zainab Chaudry, Maryland outreach director for the Council on American-Islamic Relations, attends the Jan. 16, 2019 Religious Freedom Prayer Breakfast. This article was written by V. Michelle Bernard and originally published by Visitor Magazine, the official publication of the Columbia Union Conference of Seventh-day Adventists. 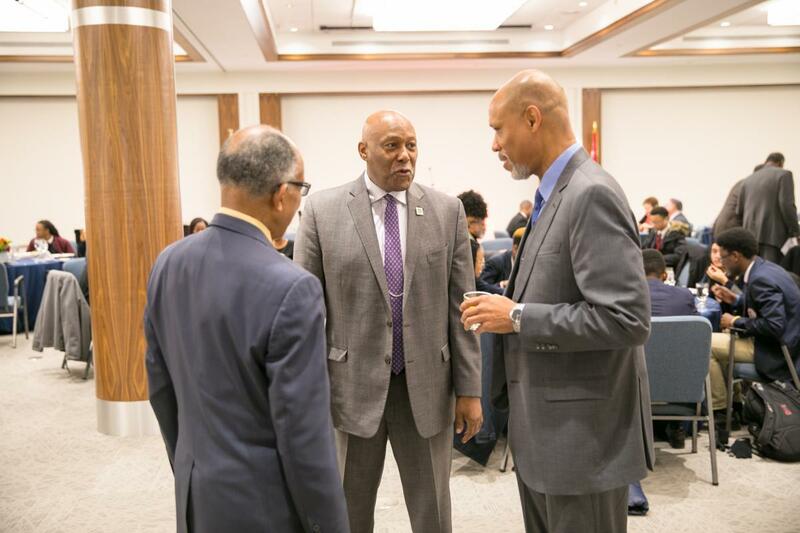 Main image: Alvin Kibble (left), NAD vice president for Big Data + Social Media, talks with local pastors Mark McCleary and Anthony Medley during the NAD's first Religious Freedom Prayer Breakfast. Photos by Andre Hastick, courtesy of Columbia Union.